I found out about this contest on one of my new SCS friend's blog. Jacque is on the design team for Magnolia-licious and is participating in her very first blog hop and she has done a fabulous job! Here is a link to her blog stop on by and check out her gorgeous creations (she has some great blog candy too!). 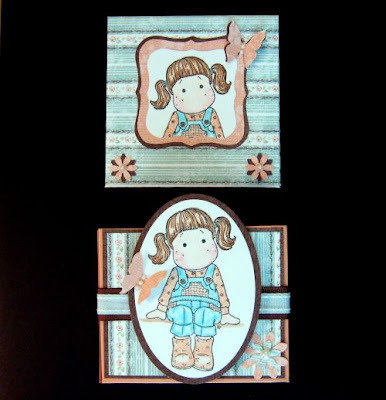 The contest is by Magnolia-licious and their design team is having a blog hop. The contest is to make this Post-It notepad holder and gift box and link it to this blog magnolia-licious-dt-blog-hop to enter for a chance to win 3 stamps from the Magnolia-licious web store - oh I am so there! So here is my entry. I am so happy with how it turned out, it is so cute! I love this Tilda by Magnolia, I think she is just called Spring Tilda. I had to re-do the measurements of the gift box as the instructions are written for use with a Scor-pal (which if you go to the blog link above you can get the instructions) and it is way confusing when you are trying to use a regular paper trimmer with a scoring blade. I fixed it though :) I used Stampin' Up paper, both the designer paper and card stock. The main card stock is Groovy Guava and the brown is actually the cocoa printed designer paper from Bella Rose paper pack. I no longer have the name of the blue designer paper pack. 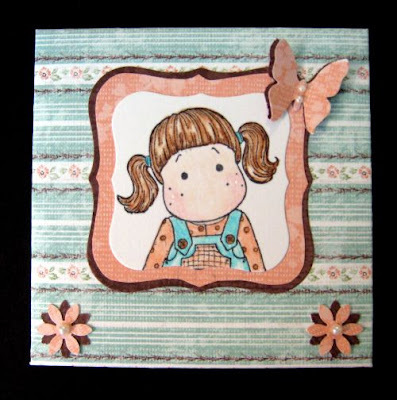 I used the Nestabilities dies to mount Tilda on and some paper punches for the butterfly and flowers. The adhesive pearls and ribbon are the rest of the embellishments. Very nice elegant looking set! Tilda looks very sweet here, nice job on the challenge. this is so cute! You have to teach me how to do this. Adorable set! Don't you love gift sets that are not only fun, but also useful? I made a set, too, and plan on using it as part of a birthday gift set. very cute! I love the colors. Very cute! Love Tilda with this great SU paper! Good luck! Just lovely--great soft colors & fabulous coloring! I love it! Thanks for joining us on the challenge!